Wangduephodrang is the last town on the central highway Wangdi Dzong, Bhutanbefore central Bhutan. The town is not more than an enlarged village with a few well-provided shops. 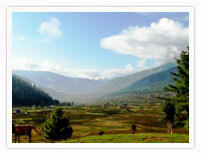 Located in the south of Punakha, the higher reaches of the Wangduephodrang valley provide rich pastureland for cattle. This district is also famous for its fine bamboo products, slate and stone carvings. Sitting on top of the hill at the confluence of Punakha Chhu and Tang Chhu rivers, Wangduephodrang Dzong is town’s most visible features. 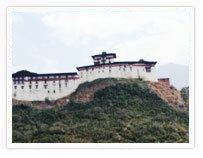 The Dzong is open for visitors during Wangduephodrang Tsechu celebrated in autumn. Perched on a small hill that rises from the valley floor, the Gangtey Monastery is the only Nyingmapa monastery on the western side of the Black Mountain’s Gangtey valley, Bhutan and also the biggest Nyingmapa monastery in Bhutan. The Monastery is surrounded by a large village inhabited mainly by the families of the 140 Gomchens who take care of the Monastery. Trongsa forms the central hub of the nation and is historically the place from where attempts atChendbji Chorten Trongsa unifying the country were launched. Both His Majesty King Ugyen Wangchuck, the Penlop of Trongsa, who was elected the country’s first hereditary monarch and his successor, King Jigme Wangchuck, ruled the country from Trongsa ancient seat. The Crown Prince of Bhutan normally holds the position of the Trongsa Penlop prior to ascending the throne. including the present King. The entire landscape around Trongsa is spectacular. 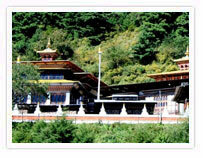 Situated before Jambay Lhakhang, Kurje Lhakhang consists of three temples. The one on the right was built in 1652 on the rack face whereKurje Lakhang Bumthang Bhutan Guru meditated in the 8th century. Second temple is built on the site of a cave containing a rock with the imprint of Guru's body and is therefore considered the most holy. The third temple was built in 1990s by Ashi Kesang, the Queen Mother. These three temples are surrounded by a 108 chorten wall. A walk of half an hour north of Kurje Lhahang leads to this monastery, founded in 1470 by Shamar Rinpoche of the Kagyupa religious school. The temple has two sanctuaries and a temple of terrifying deities. The sanctuary on the ground floor contains statues of past, present and future Buddha and three clay statues probably dating end of the 15th century. On the upper floor, the vestibule contains two remarkable paintings of Guru Rinpoche's heaven and the Buddha Amitabh's heaven. Jakar to Ura is 48 km, about one and a half hour drive. To reach here, the road climbs toJakar valley Bhutan amazingly open countryside, only occasionally running into forest. Large sheep pastures line the road up to 20 km behind the southern tip of the Tang valley. The route crosses Ura la pass (3,600m) with a magnificent view of Mount. Gangkhar Puensum. Villages in Ura have clustered houses, which is quite unusual in Bhutan. Above Ura village (3,100m) is a new temple dedicated to Guru Rinpoche. Inaugurated in 1986, it contains a huge statue of the master and remarkable paintings of the cycle of his teachings. Since last 25 years Ura has been transformed from a marginal community to prosperous valley. Terton (treasure discoverer) Pema Lingpa, the famous saint, was born in the Tang valley of Bumthang. The people of this valley raise sheep and at higher elevation, yaks as the soil in this region is not so rich for agricultural activities. From Bumthang central, it is a short drive past the Dechenpelrithang sheep farm to an unpaved road that leads to the north. Just under a kilometer ahead, there is a rough track on the left and another kilometer ahead, there is junction where vehicle can be parked. From parking, it is a short walk down to the river. The path is lined with prayer flags and ends up above a gorge where the river forms a pool before it rushes on. Images of Pema Lingpa and his two sons are carved on a rock here. Iin Tang valley is a wide spot on the Tang Chhu (chhu - water / river) and is considered to be one of the greatest pilgrimage sites of Bhutan. Pema Linga found several of Guru Rinpoche's hidden treasures here. The importance of this site is indicated by the extensive array of prayer flags and the small clay offerings called 'Tse Tsa' in rock niches. Iin Tang valley is another attraction. Restored in 19th century, it is now housing the Family Museum, a place that will transport visitors to another world and time. The visitors will view permanent exhibits recreated to capture the ambience of the lifestyle of the Trongsa Penelop (Governor) Tshokey Dorji and his household. It also serves as retreat for those engaged in religious history. Bhutan's history truly unfolds here. 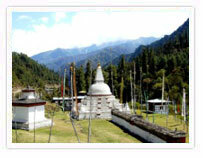 Iin the valley is a sacred place of Guru Rimpoche. A rock in front of temple bears a body print of the Guru and two khandroms (female celestial being). The site is named after the tiger stripe markings on the cliff. Footprints of the Guru and his consorts Mandarava and Yeshe Chhogyal are found below the lhakhang. Two large boulders nearby are said to be male and female jachungs (garudas).